Reverse Osmosis Membranes and Systems for Low Tap Pressures - Publications - About Us | Applied Membranes Inc.
By Dr. Gil Dhawan, Applied Membranes, Inc.
Last few years have seen a rapid growth in sales of residential reverse osmosis overseas. Membrane requirements for these systems are different than those sold in the United States. Tap pressures available in many locations are as low as 10psi. This article discusses how equipment manufacturers are adjusting their system design and the selection of membranes to meet the requirements. For reverse osmosis systems to produce product water, a minimum pressure to overcome the natural osmotic pressure of the water must be applied to the membrane. This pressure depends on the types of ions present and their concentration in the water. The osmotic pressure does not depend on the type of membrane. Roughly, every 100 ppm of total dissolved solids (TDS) contributes about 1 psi of osmotic pressure. For instance, if the TDS of feed water is 2,000 ppm then the natural osmotic pressure for this water is about 20 psi. In this case, a pressure of at least 20 psi must be applied before any permeate will come through the membrane. Generally, the applied pressure is at least twice the osmotic presure for a viable reverse osmosis system. If applied pressure is not sufficient to overcome the natural osmotic pressure, a pump must be used to raise the applied pressure. At least three different pump systems are available now to satisfy the requirements for residential systems. The selection of the optimum pump system takes into account such factors as noise level, voltage, capacity and cost. The permeate capacity of a membrane depends on several factors including the water temperature and net available pressure. If a pressurized tank is used, the tank pressure must also be subtracted from the applied pressure to get the net available pressure. The lower the net pressure, the lower the permeate rate will be. In order to compensate for the lower net available pressure, membranes with higher rated capacity are used. Membrane manufacturers have packaged more membrane are in the same physical size of 2"×12" elements that are currently used in the residential systems. The same membrane housings used for standard residential elements can be employed for these larger capacity elements. 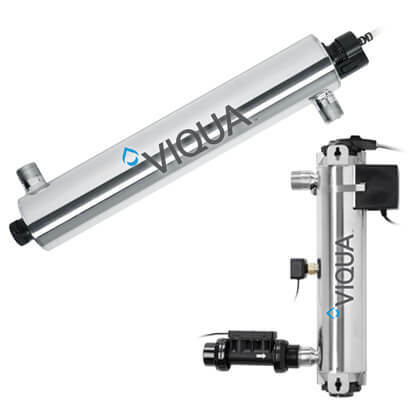 CTA elements with capacities up to 22 gallons/day and thin film elements up to 36 gallons per day (tested at 60 psi, 77 degrees Fahrenheit and with 500 ppm TDS water) are available in 2" diameter and 12" length. As applied pressures get lower and approach the osmotic pressure, the effect on the permeate flow and permeate quality gets more pronounced. Table 1 gives an example of how the permeate quality and quantity for a membrane may change as pressure is reduced. 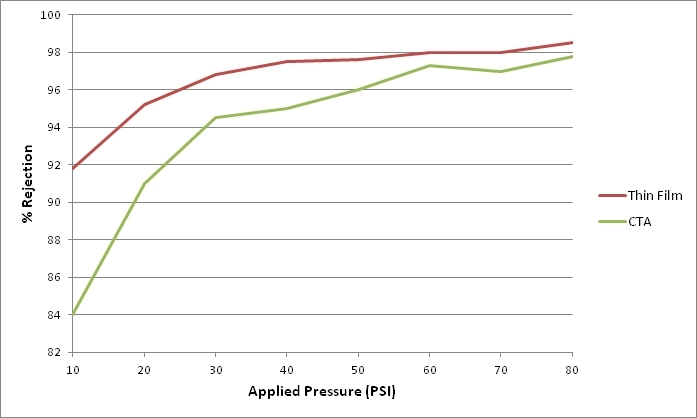 This analysis is based on a 500 ppm TDS water, 60 degrees Fahrenheit temperature and applied pressures as shown. 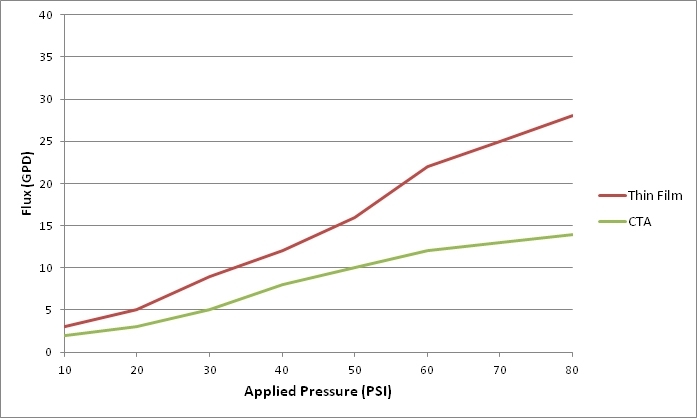 The data in the tables below is given to demonstrate the change in performance at very low pressures. Actual values may vary with water analysis, membrane flux, and other factors. In general, higher flux membranes show a relatively lower drop in performance and lower pressures. In a different study, experimental values were obtained for permeate flow and quality performance for a CTA and a thin-film membrane at very low pressure. These are shown in Figure 2.